Knesset approves amendment calling for stricter penalties for burning Israeli flags - 3 years in prison and 50,000 shekel fine. The Ministerial Committee on Legislation approved Sunday an amendment regarding Israel’s "Flag, Emblem and Anthem" law, proposed by MK Nava Boker (Likud). The bill seeks to harshen the punishment for burning flags by increasing the prison sentence to three years, as well as imposing a 50,000 shekel ($13,000) fine. Another section of the amendment, which calls for denying benefits such as scholarship eligibility and unemployment assistance, was not approved due to objections from the Justice Ministry. The objections were criticized by MK Boker. “I am pleased the first part of the bill was approved, but unfortunately the legal counsel once again stomps upon those trying to create deterrence. Apparently the Justice Ministry has yet to understand that we are at war. My bill regarded benefits and bonuses, not fundamental rights. You cannot talk about deterrence and at the same time stop any legislative attempt," said Boker. The bill was filed as the current wave of terror began, following demonstrations conducted in Israeli Arab towns and campus centers in several leading universities around the country. 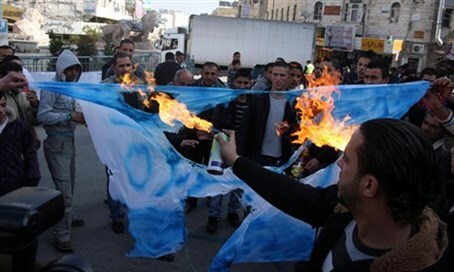 During such demonstrations, protesters would burn Israeli flags and then immediately return to their daily routine and continue to enjoy all the benefits that Israel provides to its citizens.